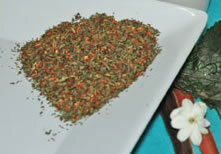 Summary : A very enjoyable, and rather sweet rooibos tea that nicely blends vanilla and mint. Review : I'll confess. I've had so many fair to poor tea tasting experiences involving vanilla teas that I tend to stay as far away as possible from teas that say "vanilla" anywhere on the package. Yet, I'm still in search of that "vanilla ice cream replacement" tea, and so like a well-trained pavlov dog, I continue to try new vanilla teas. And so it happened that this week I received a sample of tea from Little Snowbird Teas, a small, online tea shop that creates teas specifically for children as well as adults who like to try unique, sweet and all-around different teas. One of the samples I received, of course, was a vanilla tea. Now, if the package said simply "vanilla" on it, I would have had to really forced myself to try it. But alas, the tea was a rooibos tea (so no worry of bitterness) and was also a mint tea. Hence the name...Vanilla Mint Rooibos Tea. Thus mentally fortified, I hoped, I gave this tea a try. The Vanilla Mint Rooibos Tea from Little Snowbird Teas contains the following ingredients : Fair Trade Certified organic rooibos, organic peppermint, natural and artificial flavors: vanilla. Here is how Little Snowbird Teas describes this tea on their website : "Sweet and tempting, just one whiff of this delectable tea will lift you up to the clouds!" I had a sneaky suspicion that I just might like this tea due to the strong fragrance the tea had. Even before ripping open the package the leaves were in, I had a nice, rather strong aroma of mint and vanilla drifting around in my kitchen, which I considered a very good sign indeed. Still, I've been burned before by pleasant smelling teas, so I kept my hopes down. As it turned out, however, this tea surprised me in a very nice way. First of all, being a rooibos tea, the tea had no bitterness whatsoever. To me, that has always been the downfall of other black teas that have vanilla in them...the frequently awful and lip puckering bitterness you find in them. And even more happily, this tea nicely blends vanilla and mint. The vanilla flavor is strong, but it is not overpowering. Likewise, the mint flavor isn't overpoweringly strong, but yet is still quite noticeable. And the combination of the two blend nicely to produce a tea that is surprisingly sweet, rather minty yet still has a moderate flavor of vanilla too. Now true, this tea is no substitute for vanilla ice cream...so my quest continues. But alas, this tea isn't really meant to be, so I can't fault the tea for that. Overall, if you have been burned multiple times by foul tasting vanilla teas that strike you flat by their bitterness, give this tea a try. The pleasant and sweet flavor of the tea, combined with the lack of bitterness, makes for a nice drink. And the minty aftertaste is also quite nice, as the taste lingers for a surprisingly long time. Recommendation : Yes. If you've long been searching for a nice, non-bitter vanilla tea, and if you like/love mint, then this tea is for you. This tea nicely blends vanilla, mint and rooibos, allowing for a non-bitter and rather sweet tea tasting experience that has a long lasting after-taste, too.